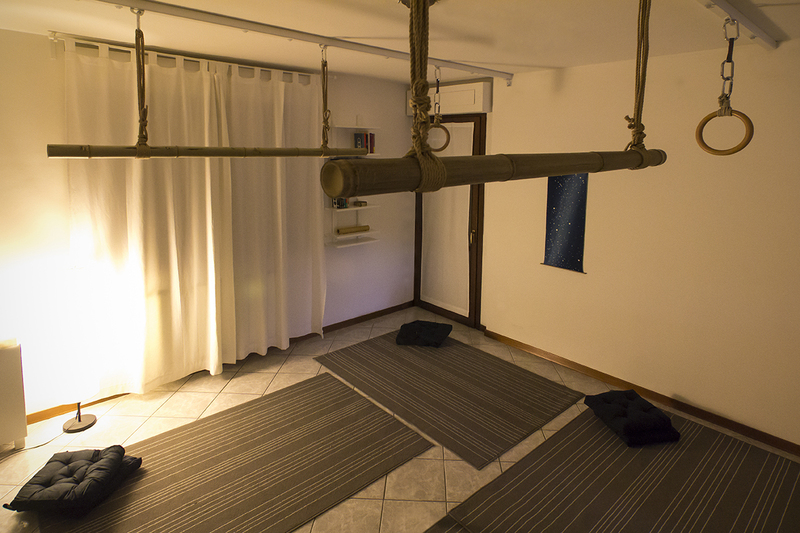 La quarta corda hosts a monthly rope jam at La quarta corda Studio in Florence (Italy). A rope jam is neither a workshop nor a play party nor a performance. It’s a meeting to play with ropes all together, to meet people, to revise a tie learned in a class. At the studio you will find an intimate and cozy location, an equipped space, some good background music. The studio has six suspension points with bamboo and wooden rings. A little bar with soft drinks, teas, coffee, herbal tea and some sweets is available to guests. Everyone is welcome to contribute something to eat or drink. Please email laquartacorda@gmail.com or phone 333 1771322 (Andrea) to book the event. It’s recommended to book the event in advance due to limited number of places..
Rope jams are hosted by Studio La quarta corda in Florence (Italy).